Your Corporate Headquarters can produce any product but only in small quantity. In order to begin to produce large amounts of product you will need to construct other structures. The Corp HQ has a Construction tab, from that screen you can choose a Category of "Structures", a specific structure (A Farm for example) and then an initial product to manufacture (Lets say Wheat! ), preferably something that is currently in high demand. You can also give your structure a custom name. You can add several structures to the queue if you like but it is much more efficient to upgrade a single structure then to create several smaller ones. The cost of the structure will be taken from your current corporate funds during the next turn. If you cannot afford to start all the construction that is queued for the next turn then they will delayed until next turn. Once a structure is built it will immediately begin producing the product you specified if appropriate. The base cost to run a level one structure is 1,000 credits per turn. This is modified by the presence of your Corp HQ in the area and by any appropriate Research you have invested in. Structures which produce products can be set to "HALT Production" which will stop producing anything and will lower your upkeep cost to 10% of normal. Your Corp HQ can also build low level military units such as transports and small spaceships. To build larger units you would need to construct Military Bases for ground units and Shipyards for spaceships. Once these structures are built they can build military units on their own. Your Corporate Headquarters is also the only structure that can build Items called Automatic Construction Package or ACP for short. These items are how you can build structures in other locations. Currently there is an "(ACP) Structure" item which can be deployed as any kind of mine or facory. There are also seperate ACP items for Shipyard and Military base. In addition there are Megastrucutres (MCP), Orbital (OCP), Planetary (PCP) and Solar (SCP) construction packages coming soon. Once constructed you will need a military unit with enough cargo capacity to pick it up, transport it and then deploy the item anywhere you choose. Assets are what make up your entire corporation and determines its net worth. 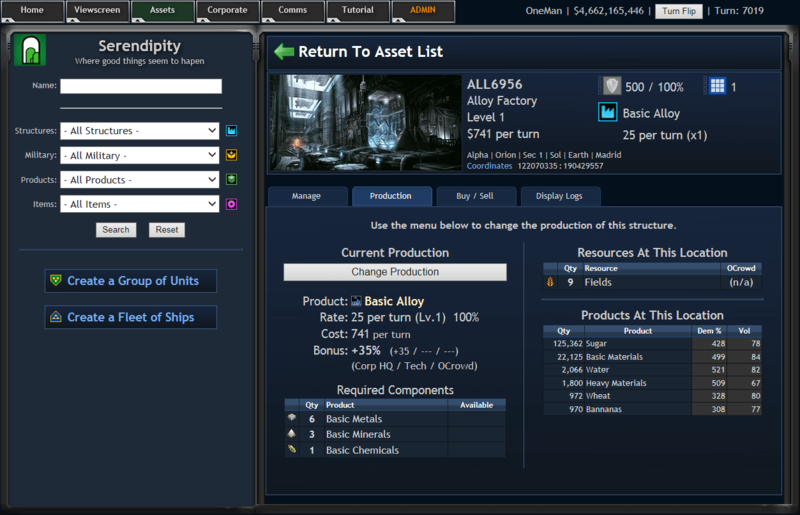 The "Asset" tab is a search engine for all the assets in your corporation displayed in a grid. There are four kinds of assets in the game: Structures, Military, Product, and Items. Structures are what produces and manufactures products in the game. Anything from a Lumber Mill to a Toy Factory is referred to as a Structure and they typically have blue icons to represent them. Military Units have a golden color and represent anything that has a combat value including transports, Infantry, Spaceships (like a Destroyer) and even defenses (like Rail Guns or Shield Generators) which don't move but protect a location. Products that have no been sold yet displayed with a green icons and display a quantity instead of a Level value. Items are special objects in the game, such as Automatic Construction Packages or special artifact items, that are usually deployed by a ship carrying them; they typically have a Fuchsia or Pink color to them. These Structures mine raw resources. Also referred to as Tier 1 products. They sell at the same value as thier demand. Creates products from resources that are also used to make other products. Requires 10 units of varying resources. Produces 10 units of components that are worth 3.25 times the current demand value. Also referred to as Tier 2 products. Manufacture a final tier of end procucts. Requires 10 units of varying components and produces 10 units of the end product. End Products are worth 7.5 times thier demand value. Also referred to as Tier 3 products. Requires components. No products created, sold directly to the city they are in. They sell at 10x times thier demand value. They are referred to as "Service" products. Special structure that creates artifact items. You can construct very large structures in a city (MCP), that orbit a planet (OCP) or even star (SCP) in pre-determined locations. These megastructures offer various bonuses or utility to the city, planet or system they are used in such as boosting population, affecting production or combat. They are deployed like regular structires but require units with large cargo bays to carry. You MUST have the highest power military force at the location to deploy a megastructure. A large squating force can prevent megastructures from being deployed. City megastructures are deployed within an existing city. There can only be one of each type of megastructure in a city. Orbital megastructures can only be placed in 4 specific locations around any planet or moon, which you can see if you check "Overlay" on the viewscreen while looking at a planet. They are location 2:22, 2:2, 22:22, 22:2 for planets and 7:17, 7:7, 17:7, 17:17 for moons. Certain megastructures are deployed at the planet or stars center at 12:12. You MUST have the highest power military force at the location to deploy a megastructure. A large squating force can prevent megastructures from being deployed. Warp Gate – This megastructures allow ships to move at an accelerated speed for a cost to the owner. To use a Warp Gate you first must have a unit move to the warp gates location then issue another move order with the “Use Warp Gate” option engaged. The cost is 1000 credits per size of the ship warping multiplied by the warp speed (1x-100x) which is paid to the owner of the Warp Gate. Once that unit stops moving and moves to another order, the warp effect ends. The cost and ability of the Warp Gate levels up like a ground unit from 1x to 100x. Orbital Guns – This is a purely military orbital which acts as 10x firepower Rail Gun (at level 1). The orbital guns around the planet will show up to any fight in which the owner is involved in, whether attack or defense. The orbital guns cannot be attacked back in these fights, their size stat is zero in these combats. If a fleet attacks the orbital at its location it defends and can be attacked as normal. Orbital Guns ONLY engage on the surface of the planet they are orbiting, they will not engage in space around the planet except when attacked directly. Starbase – A very large shipyard that can build at 2x speed of a normal shipyard. The Starbase also provides and attack damage increase to all units in a combat where the owner is involved. All units on the attacking or defending side with a Starbase will get a 1-100% increase in attack depending on the level of the Starbase. This bonus is displayed at the top of the battle report if present. It is far more efficient to upgrade structures and military units then it is to build new ones. Structures, Ground units and Ships can be upgraded to level 10 but upgrades work a little differently for each. These assets are upgraded from their "Manage" tab. Structures that produce goods are upgraded to increase their productivity. The first few upgrades is similar to building a few more of the same structure but then the upgrades rapidly rise in production increase and efficiency. By level 10 the structure will produce 120 times its normal rate! Ground Units, which includes Fighters, Bombers and Variteks increase their size and power by orders of magnitude with every upgrade although their upkeep cost only goes up a fraction of that. A level 10 Mechanized unit is as powerful as 100 level 1 units. The upgrade cost is 10% of the units cost and the upkeep per turn is increased by 10% per level as well. At level 10 the unit will cost twice as much as normal but could potentially be 3x as powerful in a given attribute.